What are weddings really about? The love between a man and a woman. Or a man and a man. Or a woman and a woman. Or a man and 5 women or a woman and 5 men. 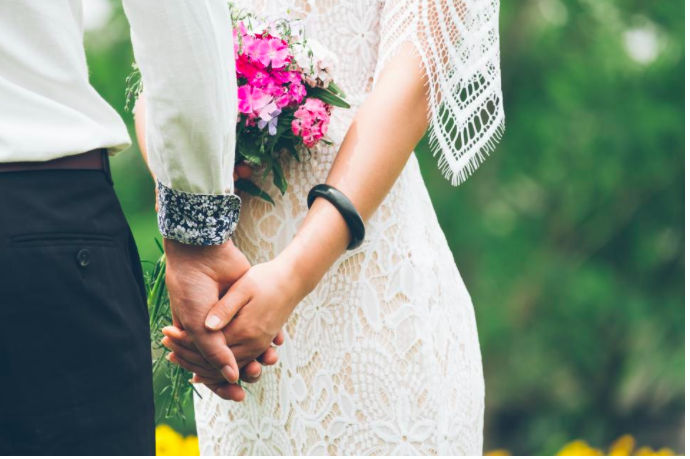 Basically, weddings are about two or more humans publicly declaring their love and their lifelong commitment to conjugal duties and joint bank accounts. All you need for this to happen is two witnesses and a pen to sign the contract. But what we usually end up having is $30,000 worth of flowers, clothes, food, pictures and champagne. It’s gotten even worse in recent years with the rise of Pinterest. Now, we feel like we have to have $30,000 worth of flowers, clothes food, pictures and champagne that are unique and home made. Pinterest is great for browsing when you’re bored, getting instructions on how to do a side-braid and being inspired by the 50 different ways you can wear a scarf, but it’s TERRIBLE for planning a wedding. The bar is set high by Pinterest. There are professional artists, designers and marketers all around the world showcasing their stuff, but it kind of seems like its mostly every-day people with regular jobs that are creating these stunning centrepieces with just a hot glue gun and some crayons. Guess what? It’s probably not. Those people are super talented! Most likely, you don’t have the craft skills or the patience of Martha Stewart. The buzzwords of Pinterest are “unique” and “DIY”, but your wedding can be just as special with a mass-produced flower crown. No matter what, it’s going to be unique because of the people who are getting married. Now, not only do you compare yourself to the weddings you actually attend, but now you compare yourself to the weddings held around the whole world. And not even the actual weddings, but beautifully shot and lit pictures of specific aspects of the wedding. Pinterest looks real, but it’s not. The images are an aspirational fantasy. You have no idea how the bride was really feeling when she was creating her own scented beeswax candles to line the aisle with…maybe she was upset because the Maid of Honour was flirting with the groom! Use Pinterest as inspiration, but don’t take it at face value. Pinterest can make you totally blow through your budget. What happens after you glue those ribbons crooked on those jam jars? You’re just going to end up buying a whole new set of jam jars! Honestly, a lot of the time people spend more money buying supplies for DIY than it would cost for someone else to make it. Pinterest also introduces you to such a vast number of ideas, you can get too exited to try them all. Focus on your top “wants” for your wedding, and don’t let yourself stray too far. Look, we know Pinterest can be addictive. You may have had a Pinterest-wedding board pinned years before you even met your financé. But trying to make a “Pinterest-worthy” can just be an added source of stress in an already stressed-out time. Because, at the end of the day, your wedding pics don’t need to go on Pinterest — they just need to make you smile when you look at them framed on your living room wall.